This book, the first single volume to collate essays about sixteenth and seventeenth century poetry, explores the remarkable changes that have occurred in the interpretation of English Renaissance poetry in the last twenty years. 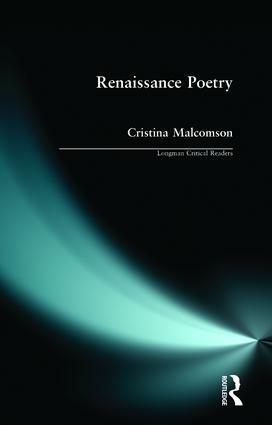 In the introduction Cristina Malcolmson argues that recent critical approaches have transformed traditional accounts of literary history by analysing the role of poetry in nationalism, the changing associations of poetry and class-status, and the rediscovered writings of women. The collection represents many of the critical methodologies which have contributed to these changes: new historicism, cultural materialism, feminism, and an historically informed psychoanalytic criticism. In particular, three diverse readings of Spenser's 'Bower of Bliss' canto illustrate the different approaches of formalist close-reading, new historicist analysis of cultural imperialism and feminist interpretations of the relation of gender and power. The further reading section categorizes recent work according to issues and critical approaches. Cristina Malcolmson is Professor of English at Bates College, USA.